With the launch of our ClubRunner-powered website, we're very excited to introduce you to the new ClubRunner Mobile App, available for download today! The ClubRunner Mobile App is available for download for iOS (including iPhone, iPad, and iPod Touch) as well as Android devices (2.3.3 or higher). 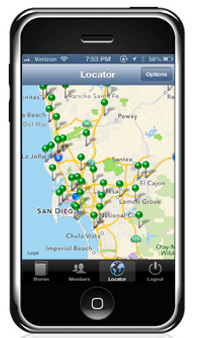 One of the most useful features is the Club Locator. Based on your current geographic location, ClubRunner's Club Locator will show you a map in real-time of all closest clubs to you (including the Downtown Breakfast Club). You can select to do make-ups at any surrounding clubs up to 50 miles away. A single click on a drop pin pulls up more detail on each club, including meeting date, time, and address. The ClubRunner Mobile App allows Rotarians to view the Club's most current member directory. Browse member profiles with full contact information, including address, phone, email, and website. A photo of each member even appears in the app. One click allows you to make a call to any member in the Club, email them from your mobile device, or add them permanently to your contacts list. The Stories that appear on our site will also be available for viewing on the go. The ClubRunner Mobile App allows members to view the latest feed of stories currently appearing on our home page, without switching browsers or apps. The ClubRunner Mobile App is absolutely free, and available today for download. Select whether you'd like to download for Android or iOS, and check it out today.